The Alsbachers lived simple lives. But they could marry who they pleased and choose their occupations. It was the yearning for those basic freedoms that brought the Bavarians and other immigrants here. Yet it is puzzling of the nine Alsbacher grandchildren to reach marriageable age, six never married. Births and deaths are in Cleveland, Ohio unless noted. Burials are in Mayfield Cemetery unless noted. Our Moses was born in Unsleben Bavaria in 1805. He married Yetta, born in far away Saxony, 15 years his junior. His place in the history of Jewish Cleveland is secure, for in 1839 he led the group from Unsleben Bavaria here. Joining with the few Jews already here, they would make a Jewish community in this town of about 3,000. There was a minyan now and one that took its responsibilities very seriously. 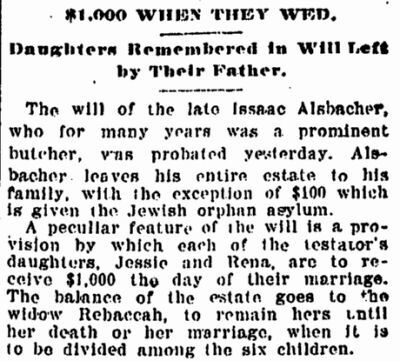 In May 1839 Lazarus Kohn, the Unsleben teacher, entrusted what we now call the Alsbacher Document to Moses and Yetta. They and their descendants would protect it until 1976 when it became the central document in Cleveland's Jewish Archives. He was a founder of The Israelitic Society and of Congregation Anshe Chesed. Moses was the son of Aaron, who was the son of Moses. In 1840 he named his only son, born here Aaron, In 1874, months after his father died, Aaron named his first son Moses. Then the long line of male descendants ended. This picture was probably made in the 1860s when he was in his late fifties, the father of four grown children and a successful meat dealer. His home on Woodland and East 22nd Street would be home to his children, then grandchildren until 1954. Urban renewal, as it was then called, tore it down in 1959. Moses Alsbacher died in Cleveland on March 20, 1874. His passing was not noted in the newspapers nor in the county records nor in the burial register at Willet Street Cemetery. His body now lies in an unmarked grave in Mayfield Cemetery in Cleveland Heights Ohio. Photo: Jewish Independent, Probably provided by Rena Alsbacher through Abe Nebel. In 1870 Moses Alsbacher's youngest daughter, 22 year old Matilda, married Latvian-born Hugo Rukeyser, who lived in Milwaukee, Wisconsin, with many siblings. They lived in Milwaukee and had three children. In January 1883 Hugo died, only 37, leaving Matilda a young widow with Sara (6), Minnie (3) and Moses (1). She returned to Cleveland with the children to live with her widowed mother Yetta (Moses had died in 1874) and sister Julia on Woodland Avenue, near the meat dealership and her brother Isaac and his family. In 1900 we find Matilda and her children living in an apartment building not far from Tifereth Israel, then called The Temple, on East 55th Street. Her sister Hannah Nathan and husband Nathan Nathan, a merchant, have left Saginaw Michigan and moved to Cleveland. Hanna is 55, Nathan is 73. 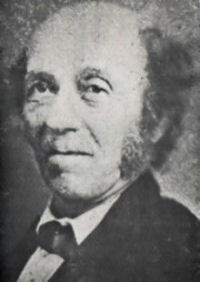 Simpson Thorman, who met the group when their ship arrived in New York, was the community leader, the founder of many organizations. But Moses Alsbacher joined in these initiatives. He was a founder of the Israelitic Society and then Congregation Anshe Chesed. When a dissident group - also from Bavaria but not from Unsleben - left in 1850 to form Tifereth Israel, taking the rabbi Israel Kalisch, with them, he remained at Anshe Chesed. 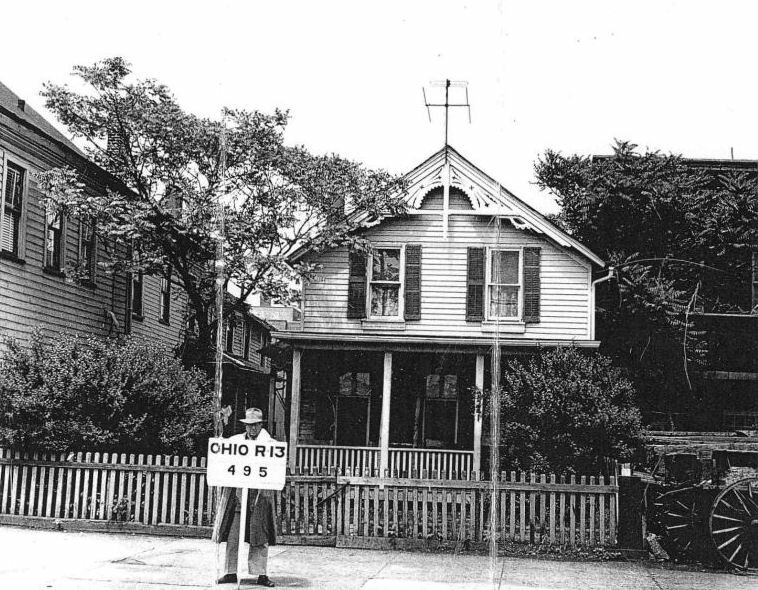 The house at 2241 Woodland Avenue that Cleveland pioneer Moses Alsbacher bought around 1858 and his family and descendants occupied for nearly 100 years. The large building at the left may be a rooming house. Note the horse-drawn cart at the right. Photo 1958. Courtesy Cleveland City Council Archives. The 1860 US census shows the families of Moses Alsbacher and other pioneers living in what was then a neighborhood of new homes with the latest amenities: city water, indoor plumbing and gas. Their home, which was in Yetta's name, had first a Kinsman address, then was 341 Woodland. In 1905 when Cleveland renamed streets, it became 2241 Woodland Avenue. As reported in grandson David Alsbacher's obituary, his father Isaac Alsbacher was married to Rebecca Klein in this house in 1866. Their six children would be born here. Four would live their entire lives in this house. Only two, Rena and Jessie, would move to the Heights in 1954, when they were 67 and 68. When the home was torn down in 1959 it was about 100 years old. In 1962 a new building would be constructed at 2241 Woodland Avenue for the Greater Cleveland Council of the Boy Scouts of America. This 1963 photo, looking northwest, shows at the left the new Boy Scout building at East 22nd and Woodland Avenue. 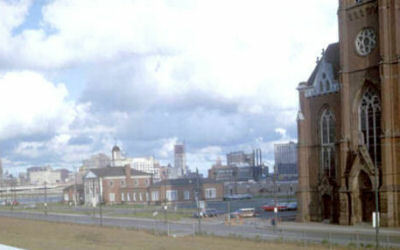 At the far right is St. Joseph's Roman Catholic Church , torn down in 1993, the land now used by Cuyahoga Community College buildings. About the photo of the Alsbacher house Except for the long-lost Tannersville picture with young Abba Hillel Silver in knickers, none of this site's more than 900 photos has a more interesting provenance. Unable to find a picture of this house but knowing it was in an area of urban renewal, I contacted Cleveland City Council Archivist Martin Hauserman who told me that property acquired using the right of Eminent Domain required approval by City Council. In the archives he located the envelope with the forms for this purchase and in that envelope was a folded photo, with a city employee holding a sign to identify the property. Yetta died at home on Feb. 4, 1892. There was no mention in the city's papers, but our oldest Jewish paper, The American Israelite, started in 1854 by Rabbi Isaac Mayer Wise, noted her passing. "Toechter Israel" is German for Daughters of Israel. What is this index card? In 1954 "Federation" engaged historian Lloyd P. Gartner to write a history of Jewish Cleveland. 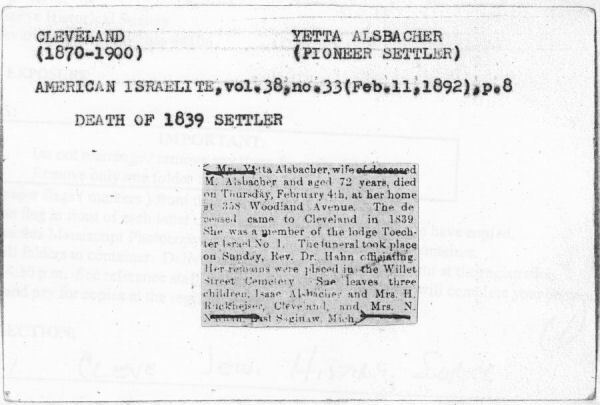 Researchers at the Jewish Theological Seminary in NY and at the Western Reserve Historical Society were engaged to read all the sources, including old newspapers, and to capture what they found on 4" by 6" index cards. The cards went to Gartner's office in Israel. The resulting book was not published until 1976. The more than 16,000 cards are available at the WRHS as "Cleveland Jewish History Sources", MS 4621 and MS 5111. 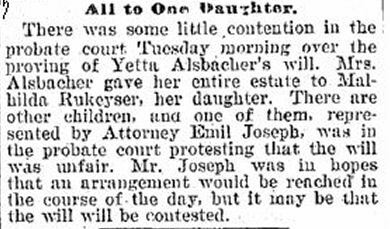 Less than two weeks after Yetta's death the Plain Dealer ran a story stating that her estate went only to daughter Matilda. The language of the will is not available to us, nor is the estate's final disposition, but the testimony is (thanks to the Cuyahoga County Archives) and it is unsettling. When the will was drawn by attorney Albert Straus, only Matilda was there with her mother. Isaac was left only $5 of an estate probably valued in the thousands. Yetta's choice is understandable. Never married oldest child Julia has died. Son Isaac is doing well in the meat business his father started. Daughter Hanna is married but childless. But Matilda, her youngest child, is a widow with three children and they live with her. A dispute over an estate can divide a family. In 1904 sisters Hanna Nathan and Matilda Rukeyser buy a plot together (see picture) in a different section of Mayfield Cemetery from the plot of their brother and his family. We conclude that it was Isaac Alsbacher who contested the will. Wedding of Isaac Alsbacher and Rebecca Klein August 3, 1869. Rebecca was the daughter of Abraham Klein who arrived in Cleveland in 1841 from Unsleben. The marriage certificate had been performed Dr Jacob Mayer, rabbi of Tifereth Israel. We find them in the 1880 census in Milwaukee. Hugo, born in Russia in 1845 is listed as a salesman for a clothing house. They have two children: Sarah (6) and Minnie (3 months). Moses would be born the following year. Hugo died at an early age, only 37, and is buried in Greenwood Cemetery in Milwaukee. In the 1885 Cleveland City Directory we find Matilda, now a widow with three young children, returned to Cleveland, and living with her mother at 258 Woodland. Were the Rukeyser children confirmed at TI? The next mention of Matilda was early in 1892, in a Plain Dealer report over contention over Yetta' estate, all of which was left to Matilda, the youngest child, the widow with two daughters and a son (Sarah was now 18, Minnie 12 and Moses 10), and none to son Isaac and daughters Jetta and Hannah. We do not know who was disputing the will, but as Isaac was doing well and Hannah was married and living in Michigan, we assume it was Julia, then 54 and unmarried. We do not know the outcome of this dispute. 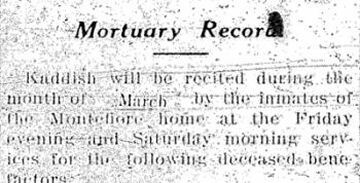 Matilda continued to live in Cleveland until her death on Nov 18, 1917. It was she who bought the gravesites at Mayfield Cemetery. They were bought in January 1904, the month that her only son, Moses, died, only 23 years old. Nearly two years later she had the graves of her sister and her parents moved there from Willet Street Cemetery. Matilda died in 1917, age 70. 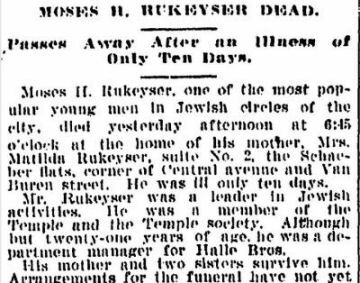 Son Moses H Rukeyser died Jan 10, 1904, only 23 years old. Buried at Mayfield Cemetery. In 1894 Matilda living at 138 Putnam Street (now East 38th). In 1904 she is residing at Schaeber Flats at Central Avenue and East 57th Street, a new apartment building two short streets from The Temple. 1903 Jessie was only 15 and Rena 16 at the time. Neither daughter would ever marry. Amount of $1,000 would be $26,000. Isaac's partner ????? who died ???? had similar provision in his will for his daughters. And the $100 for the Jewish orphan asylum explain. Moses Alsbacher was David's grandfather. Van Buren now East 57th Temple was at Central and East 55. This was a fashionable neighborhood. What did Matilda do for a living?